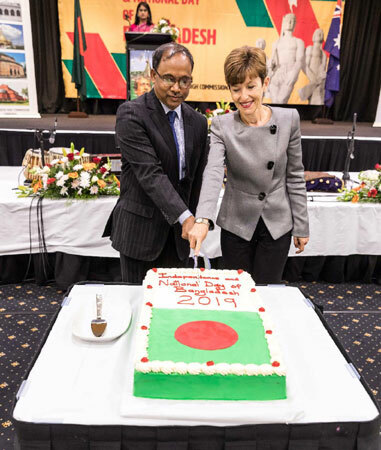 Canberra, 26 March 2019: Bangladesh High Commission, Canberra celebrated the 48th Anniversary of Independence and National Day today with due reverence and festivity. High point of the celebration was a reception hosted at the Hellenic Club. Chief of Protocol Lyndall Sachs represented the host Government. 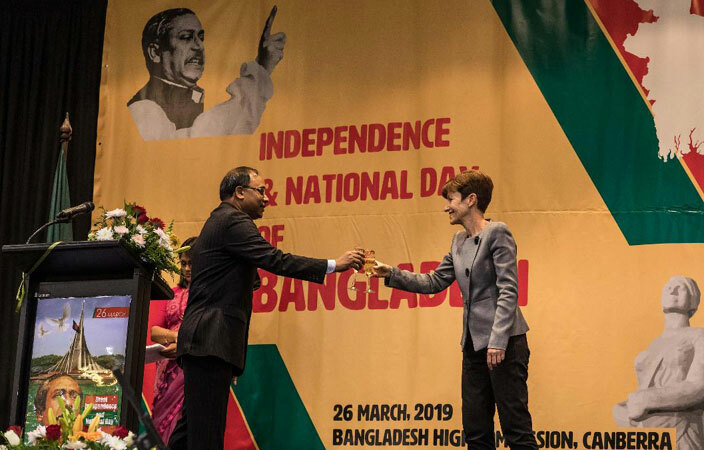 Australian dignitaries, Ambassadors and diplomats, representatives from think-tank institutions, business entities and a substantial number of Bangladesh diaspora attended the reception. Speaking at the reception, High Commissioner Sufiur Rahman paid rich tribute to the Father of the Nation Bangabandhu Sheikh Mujibur Rahman as well as to all martyrs, freedom fighters and women for their sacrifices during the liberation war. He recalled the contribution of great Australian soul William A.S. Ouderland. The High Commissioner highlighted the endeavor of the present government under the dynamic leadership of Prime Minister Sheikh Hasina to creating a just and inclusive society as well as for greater progress and economic prosperity. While emphasizing on multifaceted aspects of Australia-Bangladesh bilateral relations that witnessed a robust trade interaction in recent years, the High Commissioner underscored the room for greater bilateral collaboration for a peaceful and prosperous Indian Ocean region. The second part of the evening was a fascinating Sarod performance by the celebrated Sarod Maestro of Bangladesh Ustad Shahadat Hossain Khan. He was accompanied by the London based tabla artist Ustad Yousuf Ali Khan and Sydney based promising Sarod artist and music composer Tanim Hayat Khan. They offered an exposition of rich musical heritage of Bengal and enthralled the audience. The reception was attended by more than 350 guests, who were served with traditional Bangladeshi cuisine. 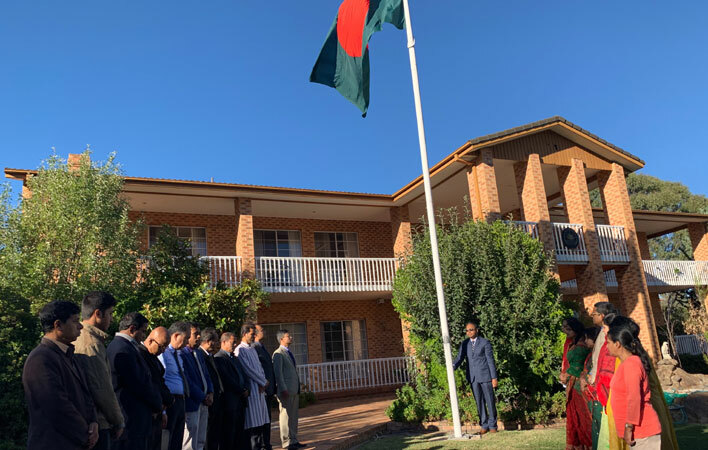 The programme of the day commenced with the hoisting of national flag by the High Commissioner in the morning at the Chancery premise in presence of the High Commission officials and members of the community. Afterwards, a special prayer was offered for eternal peace of the departed souls of the Father of the Nation, and martyrs of the Liberation War and also for the continued peace and prosperity of Bangladesh. Messages of the Hon’ble President and Prime Minister of Bangladesh as well as Foreign Minister and State Minister for Foreign Affairs were read out.